Acne is a common inflammatory skin problem faced by many people. It is caused when the sebaceous glands or hair follicles gets clogged with excess oil, bacteria, dust or dead skin cells. Acne scars are the left over marks of the acne when healthy skin tissue is destroyed. The bacteria still remains in these areas, so there is the chance of the acne returning. There are many products available to treat this problem, however natural home remedies give the best results. The fatty acids like omega – 3 it contains will penetrate deeply through the epidermal layer of the skin to heal the scar tissue and erase the scars completely by promoting the growth of new skin cells. It draws out the dirt, bacteria, excess oil and other dead skin cells from the skin. It stimulates the lymphatic system which enhances the lymphocytes number in the body that makes the skin less prone to scars. It effectively moisturizes the skin and increases the cell’s regeneration. It stimulates proper blood circulation, calms the inflammation and detoxifies the healthy cells. It is enriched with unsaturated fatty acids, proteins, minerals and vitamin E that heals discoloration and reduces the acne scars. Follow these remedies to get rid of acne scars. The application of the oil on it’s own helps to soften the scar tissue and thus reduces the inflammation. Clean the affected area thoroughly with mild soap. Steam your face for few minutes to open up the skins pores. Apply a small amount all over the affected skin before bed. Massage gently for a few minutes so the oil penetrates deep into the skin. Leave on overnight and wash off the next morning. Or you can also apply on scars and wrap with a plastic wrap. Then place a hot water bottle on it to for about 20 – 25 minutes. Pour the oil in a bowl and dip a clean cloth in the oil. Let it soak for few minutes then squeeze to remove excess oil. Place on the affected skin, avoiding eye areas. Leave for about 30 – 50 minutes and then remove from the skin. Do not wash your face after application as this oil does not clog the pores. Or apply black oil on the scars with a cotton ball and use a medical tape to hold it on the same place for few hours a day. Mix equal quantities of castor and grapeseed oil and apply on the scars. Massage gently for a few minutes to spread the oil evenly. Leave it on for few a hours to overnight, then wash off thoroughly with water. Pat the skin dry and repeat the same process regularly. Mix a few drops of organic coconut oil. Apply on the affected areas, massaging gently, and leave for a few minutes. Wash off and repeat the same process regularly. Or You can use olive oil instead of coconut oil but was the face with warm water after 30 – 40 minutes. Vitamins E and D are used to improve the appearance of scars. Extract the oils from one vitamin E and D capsules. Add 4 – 5 drops of the oil in it and mix it well. Apply this on the affected skin and massage gently for a few minutes. Leave for few minutes and Wash it off with water. Stir 2 – 3 drops of lavender oil in 2 tablespoons of oil. Apply on the affected skin and massaging gently. For more effective results, follow this process 3 times a day. St. John’s wort has scar healing properties that reduce the scars very effectively. Mix 2 – 3 drops of wort oil in 2 tablespoons of oil. Apply on the affected skin, massaging gently for a few minutes. Repeat the same process twice a day. This process is used to heal old acne scars on the skin. Mix oil with Shea butter. Apply this on the acne scars and massage gently for a few minutes. Leave overnight and wash off the next morning. This face pack acts as a gentle scrub and removes dead cells, cleans and lightens skin and reduces the scars. Mix 1 tablespoon each of fresh lemon juice and oil. Apply on the affected areas and leave for a few minutes to dry. Before washing, massage the skin with 2 tablespoons of curd or green gram flour for 2 minutes. Wash off with water and dry the skin. You can use fresh tomato juice / pulp instead of lemon juice in this method. Mix a small amount of baking soda in oil. Apply this mask on the affected skin. Mix 60 ml of jojoba oil, 24 ml of apricot kernel, 18 ml each of oil and evening primrose oil and 10 drops of vitamin E oil in a bowl. Massage gently for a few minutes and wash off with water. Follow these tips and precautions for safe and quick relief from acne scars. Castor oil is not recommended for pregnant or lactating women, or people who have weak constitution or are suffering from diarrhea or anemia. It will take quite a few uses for results to start to show. Be sure to do a patch test first to make sure you are not allergic to it. Remember that it is thick in consistency, so you only need a small amount. Never ever apply it on the open areas of scars or on nostrils or eyes. You can also find many commercial scar reduction creams with castor as the main ingredient. For more effective results, use Jamaican Black Castor Oil for acne scars. Be sure to protect your clothes or bed sheets while using castor as it could stain your clothes. You can also add tamanu oil in it to fade scars at a faster rate. Make sure to consult your doctor if you didn’t find any relief from the acne scars. While using these methods, make sure you have a proper nutritional diet, have proper lifestyle habits with good skincare hygiene. Please feel free to share your experiences with us. The methods mentioned above in the article will help you lighten the pimple marks. Choose any one of them and try it regularly until you achieve the results. Apart from that you should exfoliate and moisturize regularly. does it really reduces large pores on face? I have tried almost everything…. and even coconut oil too….it once resulted in very bad acne….so from that nightmare experience …m bit afraid to do so….use castor oil on my pimples and their stubborn marks….help me a bit..plz? Hi maybe it’s coz you are allergic to coconut oil or you have an oily face.. I too suffered terrible acne from coconut oil, but castor and tea tree oil work pretty well for my face. I just started using them in combination about 5 days ago, and the cystic acne spots on my face are noticeably reduced. Witch hazel spot treatment has also worked very effectively for me in the past, as well as Zinc oxide (Desitin diaper rash cream, believe it or not…) Best of luck to you! Im gonna try this prosess today, I tell you after 14 days with flawless skin ?. I’ve try everything I pray it works. 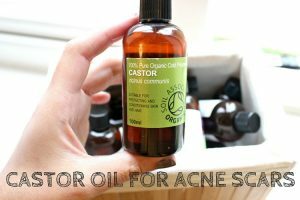 I have almost all skin problems on my face like acne,old acne scara, blemishes, open pores and wrinkles.I have done everything chemically.now I am using castor oil from last 5 days.does it help in above mentioned problems.how it should be applied? Yes, it helps to treat acne, acne scars, blemishes, open pores and wrinkles. Take a small amount of castor oil and apply it evenly on the face and neck. Leave it overnight and rinse off in the morning. how long do i let the castor oil w/baking soda mask on my face? Leave the application for 10 – 15 minutes before rinsing off. Castor oil is used for removing moles tooo with baking sida that is. Is i harmful if i keep it overnight on the mole? And can i use castor oil on my whole face even when i dont have scars all over my face? You can leave it overnight. It doesn’t cause any harm. Yes, you can apply it all over the face even if you don’t have scars. But make sure you don’t apply in excess as it may clog the pores. Can i use castor oil and baking,soda overnight on my acne face? Nope, leaving baking soda overnight can be too harsh on the skin. So, it is better to leave the application only for 15 – 25 minutes and rinse off with water. You can repeat the process 2 – 3 times in a day for achieving the results. Thanks very much for your article. I’ve had a small spot of facial scar tissue for nearly 8 years, due to an overly aggressive pimple removal method that I’ll never try again (rubbing alcohol… so dumb). This one spot now always seems to give me problems (recurring acne), and I notice that you state the bacteria can live on within scar tissue. Would castor oil help to permanently rid this problem spot of the recurring acne problem? Best regards. Yes, castor oil contains potent anti-bacterial properties and deep penetrating power, so it will combat the bacteria causing acne even if it is hidden in the deep layers of skin tissue. So, give it a try and share your experience. 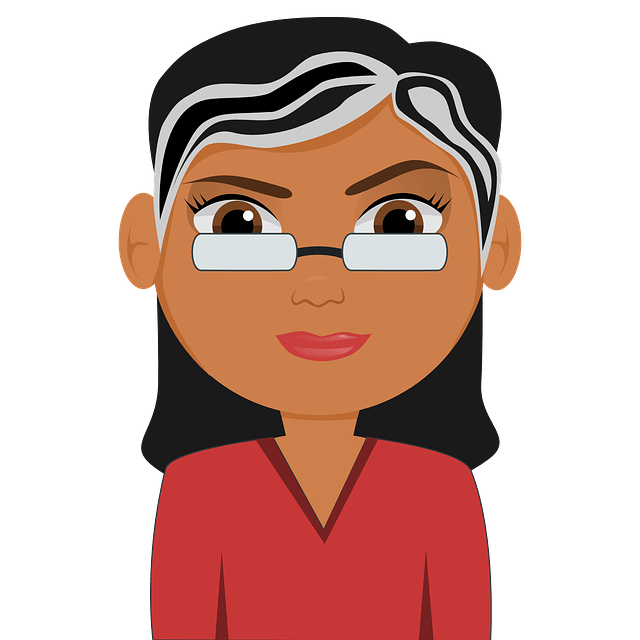 I am a 54 year old dark skin African American female, who skin became damaged and darker with melasma under eyes cheeks, forehead, jawline and neck, I have tried everything nothing works. I have been using cold pressed castor oil for about a week will it fade and make my melasma lighter and if so how long will it be before I I see results, I use it in morning and night. 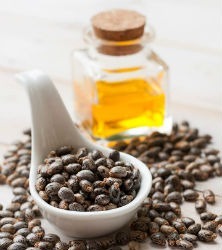 Instead of castor oil, we recommend trying the routine mentioned in this article – http://homeremediesforlife.com/skin-lightening/ for lightening the melamine, reduce tan and get back your color. I’ve really dark spots on my face due to pimples.. and now I’ve started using castor oil with vitaminE. How long will it take to lighten those marks..!? It is difficult to tell the exact time frame as everyone’s skin texture and healing capacity is different. So, we recommend trying the remedy regularly as specified until you achieve the results. However, you will observe the difference within 2 – 3 weeks. I have dark spots in my face so what is the best method to getting rid of dark spots ? Hello my name is kalyani and i am 39 years old .. Frim ladt 4 months i am suffering from pimples which r causing black spots also ..i am also havingbm thryroid which is in control ..my qiestion is can i use castrol for whole nite to get rid if these marks. Yes, you can leave castor oil whole night to reduce the dark spots. I am a teenager girl and I have pimples and pimple marks. My question is, can castor oil help me remove this? Thanks. Yes, castor oil contains omega-3 which will penetrate deep into the epidermal layer and heal the scars completely by promoting the new skin cells growth. If I apply caster oil all d n8.. Den hw will d skin breathe? Thanks for sharing this amazing article which if God wills can work effectively. however, I am an African girl but with lighter skin than those in Africa. my skin got ruined by those ugly scars some years ago. for how long should I use castor oil to quickly vanish it? Hi, I have acne marks which leaves the skin on my face uneven. Will castor oil help it even? Hi. I have been suffering from acne and acne scars from last 10 years. I have acne scars on my chin. I used many products. Almost faded. But again acne starting same area. And it remains scars. I have oily skin. Please suggest me good remedy.